CSR implies a concept, whereby companies decide voluntarily to contribute to a better society and a cleaner environment – a concept, whereby the companies integrate social and other useful concerns in their business operations for the betterment of its stakeholders and society in general in a voluntary way. Corporate Social Responsibility (CSR) is an immense term which is used to explain the efforts of a company in order to improve society in any other way. CSR improves the public image by publicizing the efforts towards a better society and increase their chance of becoming favorable in the eyes of consumers. CSR increases media coverage as media visibility throws a positive light on the organization. CSR helps companies to stand out from the competition when companies are involved in any kind of community. After considering the recommendations made by the CSR Committee, approve the CSR policy for the Company. The Board of Directors shall make sure that the company spends in every financial year, minimum 2% of the average net profits made during the 3 immediately preceding financial years as per CSR policy. Every company to which CSR criteria is applicable shall constitute a Corporate Social Responsibility of the Board (i.e. CSR Committee). Minimum 3 or more directors must form CSR Committee. Among those 3 directors, at least 1 director must be an independent director. An unlisted public company or a private company shall have its CSR Committee without any independent director if an independent director is not required. In case of a foreign company, the CSR Committee shall comprise of at least 2 persons of which one person shall be a person resident in India authorized to accept on behalf of the foreign company – the services of notices and other documents. Also, the other person shall be nominated by the foreign company. The CSR Committee shall formulate and recommend a CSR policy to the Board. 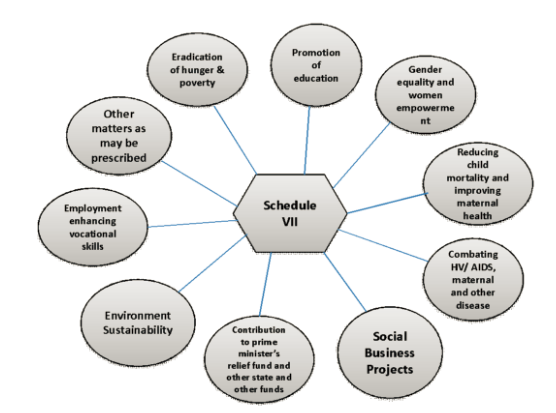 CSR policy shall point out the activities to be undertaken by the company as enumerated in Schedule VII. CSR Committee shall recommend the amount of expenditure to be incurred on the CSR activities to be undertaken by the company. CSR Committee shall monitor the CSR policy of the Company from time to time. The Board’s Report referring to any financial year initiating on or after the 1st day of April 2014 shall include an annual report on CSR. In case of a foreign company, the balance sheet filed shall contain an annexure regarding report on CSR. The CSR policy shall monitor the projects or programs. Explanation: For the purposes of this item “slum area” shall mean any area declared as such by the Central Government or any State Government or any other competent authority under any law for the time being in force. We live a dynamic life in a world that is growing more and more complex. Global scale environment, social, cultural and economic issues have now become part of our everyday life. Boosting profits is no longer the sole business performance indicator for the corporate and they have to play the role of responsible corporate citizens as they owe a duty towards the society. The concept of Corporate Social Responsibility (CSR), introduced through Companies Act, 2013 puts a greater responsibility on companies in India to set out clear CSR framework.